Just some of the writing books in my reading pile. If you’re like me, you’ve probably spent time trying to figure out the how to write a book. Not just the putting pen to paper bit, but the step-by-step process of planing, outlining and drafting. 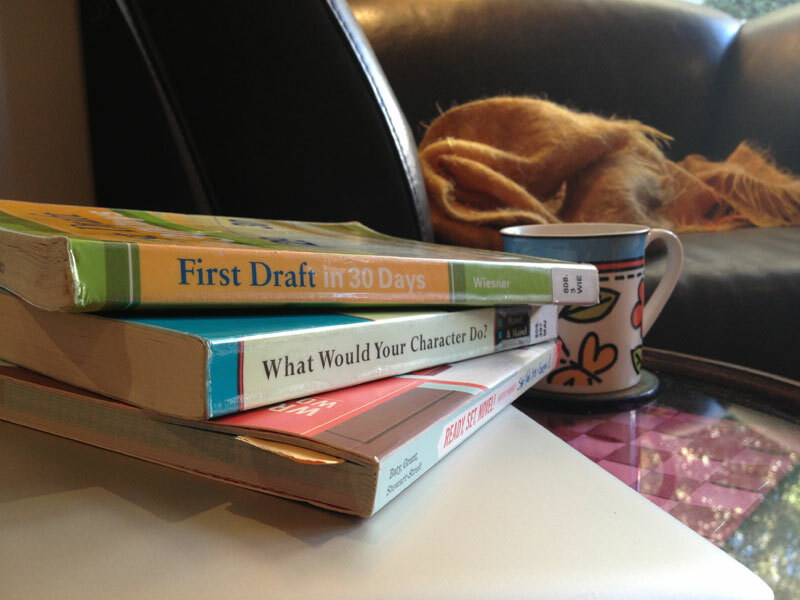 You’ve probably read books with titles like First Draft in 30 Days and No Plot? No Problem! . You might even have flirted with beat sheets, the Snowflake method, phase drafting and a hundred and one other techniques that promise to make your writing life easier. I have read, and flirted with, all of the above. Some have worked, and continue to do so, some haven’t, but none have provided me with what I really, really want. A holistic process, from brainstorm to finished manuscript, that works for me. That’s the key phrase, something that works for me. All of the above are geared towards the quirks, knowledge and experiences of the people who created them, which works great for them, but not so much for me. At the start of this year (2013), I read Whatever it takes: An exploration of Writing Tools and Strategies for Completing a Novel by Louise Ousby. It’s a thesis (but not a boring one) that, as the name suggests, explored various novel-writing tools and methods published/created by other people, to find the ones that worked best for Ousby. It was awesome. My brain exploded. It wasn’t one of those messy, brain overload explosions, it was an idea explosion. An awesome idea explosion. In fact, the idea was so awesome I wondered why I hadn’t thought of it before. You’ve probably thought of it already. I was going to do what Ousby did, I was going to dive into all of the books, websites and podcasts and cherry-pick all of the novel-writing tips, techniques and methods that worked for me and, from all this cherry-picking, construct my own novel-writing process. One of my goals for this “create your own writing process” thing, is to develop a resource for other people (e.g. you) to do the same. Obviously, the not every step (or possibly any) of my writing process will work for you, but hopefully the way I went about finding them, and developing my process, will. You’ll find all of my reports and musings my explorations under the Writing menu in Writing process, as well as writing templates, tips and techniques.